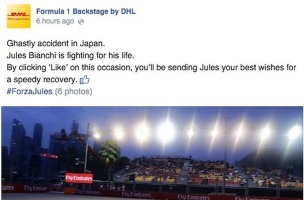 There are countless ways for brands on Facebook to entice users to like their posts, but using a seriously injured race-car driver as bait is not a recommended one, as German logistics company DHL discovered this past weekend. 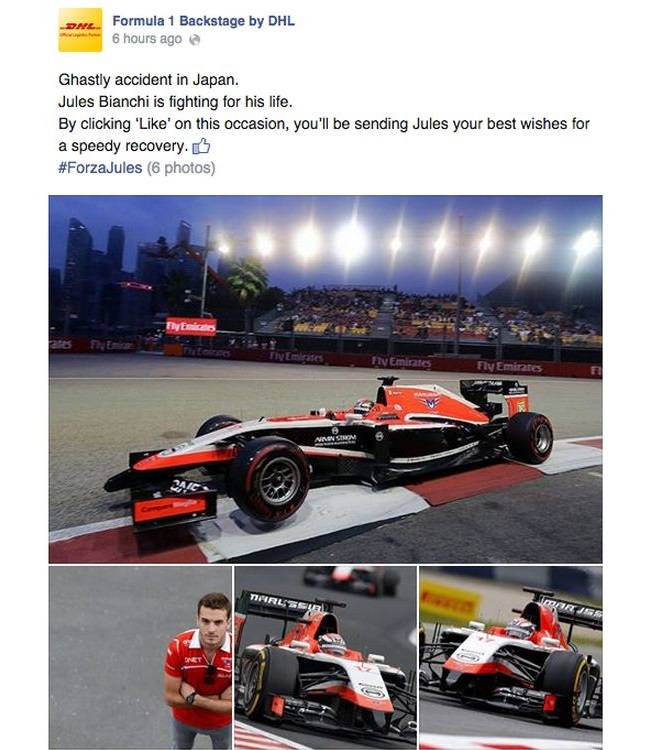 Metro.co.uk reported that DHL came under fire for a since-deleted Facebook post after Jules Bianchi, a Formula One driver on the Marussia team, crashed during the Japanese Grand Prix and underwent brain surgery. DHL was blasted on Facebook and Twitter for the post, Metro.co.uk reported, with most comments based on the fact that clicking like would only benefit DHL’s Facebook marketing efforts, and not reach Bianchi during his recovery. With regard to the communication of information concerning Jules’ medical condition, we will respect, and be guided by, the wishes of the Bianchi family. Together with Jules’ care, they will remain our highest priority. Therefore, we would ask for patience and understanding with regard to further medical updates, which will be communicated in conjunction with the Mie General Medical Center in Yokkaichi, where Jules is being treated, when they feel it is appropriate. Representatives of the Marussia F1 Team and Scuderia Ferrari will remain at the hospital to support Jules and the Bianchi family. Readers: What did you think of DHL’s post?